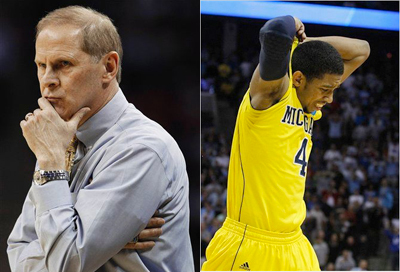 John Beilein is not a great recruiter. With the exception of the occasional diamond in the rough (Tim Hardaway Jr., for example) Beilein's recruiting can be generously called pedestrian. Some of that is surely due to the fact that he's a system coach, and it's a system that a lot of kids believe is unable of getting them to the next level. Other factors may be more self-imposed: Beilein is looking for a very specific player, the likes of which aren't typically ranked highly in the national recruiting game. But what Beilein lacks in the recruiting scene, he makes up for by being arguably the best Big Game coach in the country. If you gave identical sets of players to Beilein and any other coach in the country and gave them a week to prepare before playing one another, the smart money is on Beilein. From the Clemson game in Michigan's last Tourney appearance, to the throttling of Tennessee on Friday, to the two-point loss to the defending national champs yesterday--a game in which Michigan probably gave up an average of three inches at every position--Michigan's efforts in big games are Herculean, in no small part because Beilein just Gets It. Were the rim just a smidge bigger or the refs not so intent on giving Coach Krzyzewski his 900th win yesterday, Michigan could have very well knocked off a team they had no business being on the court with, in no small part because of Beilein. But after a somewhat miraculous run (that began just moments after I started wondering if Beilein should even be retained next year), Michigan finishes with their second NCAA Tourney win in three years and will return its entire team next year to make, hopefully, a serious run at the Big Ten title. And while last year, when the team began the season ranked a lofty #15 in the country and sputtered under infighting and lofty expectations, next year's team will have the look of one that, on paper at least, has been there before and is ready for the challenge. Officiating. Ugh. There were more touch fouls called against Michigan against Duke than I've ever seen in a college basketball game. Jordan Rules applied to the entirety of their roster and the refs were going to be damned if their names didn't go down in Krzyzewski's scrap book as the guys who whistled their way to his 900th win. In spite of that, Michigan found a way to keep the game within reach, largely because of the 1-3-1 that they went to late in the second half. They showed the zone earlier in the game and it was duly shredded because the players weren't aggressive enough. For the 1-3-1 to really work, players have to aggressively attack the ball handler and trap whenever possible. In the first half, it was a passive zone that Duke cut up, but in the second half, Duke started running clock too soon and Michigan could attack and trap causing difficult shots. Speaking of zones, that's basically all Michigan did against Tennessee on Friday where they showed the world just how bad the Vols are at shooting round orange balls into metal hoops. That was pure annihilation. Kudos to the team for not just winning another Tourney game, but for handing in the biggest trouncing in the history of the 8-9 matchup. That runner by Morris. Should. Have. Dropped. The team deserved it. Hardaway, while he ended with a decent stat line, seemed nonexistent against Duke until that ice cold three pointer late in the game. Some of his energy was spent covering Kyle Singler on the defensive end, but when Michigan's offense was sputtering, it would've been nice to see him get a few more looks. Though Zack Novak may have a limited skillset, dude is money in big games. Shooting 4-6 against Tennessee and 4-9 against Duke from the outside confirms that Novak is Michigan's go-to three point shooter. Stu Douglass, on the other hand, disappeared from sight during the tournament. Getting him back to his long-range shooting form will be essential if Michigan is able to make the proverbial leap. The big men all looked good in the tournament. Jordan Morgan was slipping screens all game against Duke and distributing the ball well. Although he ran into the foul trouble in both games (you can hardly blame him against Duke). Evan Smotrycz had probably his best game of the year against Duke. If that's what we can expect all of next year, look out. Jon Horford even got some burn and in his limited time, managed to posterize a Dukie. To the offseason we go, but this year, there will be less "Are we going to win any games next year?" and more "I can't wait for this team to get back on the court." Morris, Hardaway and Smotrycz were all ranked as top 100 recruits (by ESPN). Bundridge and Burke are as well. So beyond his first season, Bielien has done very well in recruiting. Maybe that's 'not great' but it's better than 'pedestrian' given the situation Michigan was in. Furthermore, he's shown an ability to find 'diamond in the rough' types outside of the top 100. Bielien recruits to create a roster that makes sense, not to maximize talent. He has managed to find pieces that fit. Even his first make-shift/transitional recruiting class of white shooters seems like a smart pair to go with Harris and Sims. Furthermore, I'm not sure what 'specific type of player' you're referring too. It seems like Morris and Douglass, Morgan and Smotrycz, Vogrich and Bundridge are very different players. I'd say Bielien recruits a very diverse kind of player compared to most programs. Stu is disappointing on offense but he played tremendous D. His outside shooting threat and his ability to focus on defense opens up the game for Morris. He has no business being a backup PG, but he's a perfect compliment to Morris. His minutes went up as the season moved forward and the team was better with him playing than not. Good point on Hardaway. The lack of a 3rd guy who can create offense really hurt this team. Should be better with the freshman around next year. Prediction: Horford will be the most improved player next year. He has range on his jumper and is the teams best rebounder and shot-blocker by a mile. Plus the Horford family is famous for 'late-bloomers'. I think you'll see a lot less of Novak playing 38 minutes next year as Smotrycz and Horford get better and the backcourt fills out with scholarship players. Novak and Hardaway could probably split some time at the 3 with the second unit. For Michigan to really take the next step, Smotrycz needs to improve at the 4 so that Novak can move down to his natural position. Who knows what'll happen in the offseason, but I'm excited for the potential size shift, where Michigan can finally compete with taller teams. Most people seem to think a more conventional lineup with a bigger PF is the answer. Here's problem 1: Novak isn't as good at his 'natural position' as he is as a PF. As a 3, he's just a spot-up shooter because he isn't skilled enough to dribble around other wings. Guarded by 4, he's more dangerous, more likely to get open, and better at opening the floor for Morris. Defensively, his excellent boxing out is neutralized (since 3s generally rebound less than 4s). In short, his matchup advantage is gone and he becomes just another guy. Problem 2: Stu Douglass. If Novak slides to 3 that squeezes out Douglass and Vogrich in favor of 10 additional minutes of Smotrycz plus Horford and McLimans having to back up Morgan and Smotrycz. Stu is already getting squeezed because he won't be the backup PG again (a role he struggled in). So if he's nothing more than a backup wing player you're talking about him playing 15-20mpg, half of what he did this year. Stu Douglass was a big part of this team's success. His minutes increased as the season moved on and that coincided with the team's improvement in performance. He makes Morris better not only by spacing the floor, but taking the burden of defending the top scorer (a role Novak and Hardaway can't match). I'd argue if it ain't broke - don't fix it. Smotrycz can wait a year for Novak to keep playing where he is best. Maybe he steals 5 minutes or so from Douglass but I'd hate to see Stu relegated to a role player in his senior year. Small ball has significant advantages and Michigan competed with taller teams just fine (Illinois and Duke are amongst the tallest in the country). I think you underestimate Smot and his potential development as a 4 though. I don't think he'll stop seeing time at the 5 b/c JB likes small ball, that being said. Him seeing increased minutes at the 4 does not effect our spacing as he is a good 3pt shooter (better than Stu). He will still hover around the perimeter and pick his points when to go down low. Afterall, 4's in JB's systems are basically 3's in a normal one. His size will also help us rebound on D and Zone Defense. Novak at the 3 also does not effect our spacing as he became arguably our most clutch 3 pt shooter. Sure he'll lose any quickness advantage but lets be honest. How often did he drive to the hoop this season? Novak IS a spot up shooter, great rebounder/post defender for his size. By moving him to the 3 he can still spot up for 3's and he can still crash the boards (offensively and defensively). Our reb metrics would improve substantially with him at the 3(if he can box out 4s what will he doe to 3s?) and we wouldn't sacrifice 3pt shooting. I'm also confident he could guard anyone Stu could guard on a man to man basis (you prob disagree on this though and thats fair). IMO, stu great perimeter D just consist of *trying* to keep the man in front of him and contesting shots. Novak can do that. we will just have to disagree with regard to Stu. He played 30mins this season largely b/c he was backup PG, the idea of his mins cutting back to 20 as only a back up wing sounds good to me. With those minutes he can still start and finish games(as I think he will b/c of experience). But the time in between will be used for Burke and Smot PT (thereby pushing Novak and THjr down a spot to 2 and 3). Whatever we lost in man defense in this lineup we more than make up in offense and improved rebounding (O and D). we have to rebound better. Granted I don't expect UM to sweep the above but picking up 2 out of those 8 gets us a top 6 seed and aovids us playing 1 seeds in rd 2.